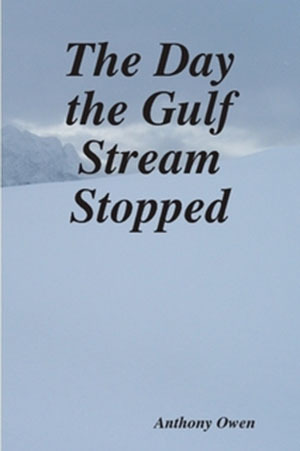 Anthony Owen's novel The Day the Gulf Stream Stopped has essentially the same premise as the hit disaster movie from five years earlier, The Day After Tomorrow. The Gulf Stream ocean current, which has long played a crucial role in our planet's climate system, undergoes a sudden collapse driven primarily by human-caused global warming. Ice caps rapidly spread across the northern hemisphere, rendering places like New York City and western and northern Europe uninhabitable to all but the most rugged survivalists. Scores perish but a few hardy souls survive to rebuild. These two entertainments differ in some key respects. Most crucially, the movie's action takes place during the disaster and seeks to capitalize on the spectacle, whereas the novel begins years into the aftermath and has more cerebral ambitions. In addition, the book posits a far more plausible timeline for the disaster: a few months, versus mere days in the film. Though the two aren't really comparable, I like Owen's tale better, having always preferred sci-fi world building and quests for knowledge to mindless summer action. Genre-wise, Owen's novel is an interesting mix. It combines satiric dystopia with hard sci-fi similar to what the great visionary Arthur C. Clarke was known for writing, which strives to imagine bold new technological possibilities within the realm of scientific plausibility. On this latter note, there's a genuine sense of wonder when our main characters discover a cunning approach devised by one valley community to keeping warm in a frigid climate. By covering an entire mountainside with reflective lenses that focus the sun's rays down into the valley, the community has fashioned a livable human environment out of what would otherwise be a barren icy landscape. "It's like a school physics lesson all over again, but on a big scale," enthuses one observer. The novel's two central characters have also shown their share of innovation and adaptability in the face of an unforgiving climate and the demise of today's technological systems. Married couple Bob and Jennie Preece, who met as science students before the Big Chill, have ingeniously outfitted their home on the coast of England to provide a rare semblance of early-21st-century life. It's been a decade and a half since life as we currently know it ended, and yet Bob and Jennie still enjoy access to such niceties as a working computer and indoor lighting. They generate their electricity through a brilliant scheme that involves charging old car batteries by peddling on a stationary bicycle, then using an inverter to turn the direct current in the batteries into alternating current that can be used for appliances, lighting and electronics. Our protagonists' daily existence is a model of self-sufficiency. Their food consists of produce grown in a greenhouse, herbs from a windowsill garden, chicken they've raised and wild-caught fish (that is, whenever the ice covering the nearby Severn Estuary isn't too thick for fishing). Since water no longer flows from the taps, Bob and Jennie obtain their water by melting snow. In the absence of retail stores, they have their own household economy in which they make their clothing, textiles and even their mode of transportation–a sleigh constructed from wood scavenged from derelict houses. To keep warm, they burn some of this wood in their fireplace. Though the research institution where Bob once studied for a doctorate in climate physics, and Jennie an undergraduate in biophysics, has long since folded, these two haven't given up their scientific pursuits. They have measuring instruments placed around their home, and each morning they record the air temperature, pressure, humidity and wind velocity. Their neighbor Tom, who is Bob's former academic advisor, collaborates with them on their research, as well as in managing the rigors of the harsh life they lead. Bob and Jennie's call to adventure comes when they receive their first visitor in years. A man named Ifan Jones has spent all day trekking across the estuary, a trip of 10 miles that he made wearing wholly inadequate clothing. When Ifan stumbles on Bob and Jennie's home, he is frostbitten and suffering from exposure. He has traveled from the Welsh town of Penarth, which used to be a wealthy seaside resort but is now every bit as abandoned as the place where Bob and Jennie live–another former coastal resort community known as Weston-super-Mare. Despite his compromised health, Ifan is elated at having made it to Weston. He is the last surviving member of his community and wouldn't have lasted much longer. Ifan requires medical attention following his hike across the estuary, and thus begins the first trip that any of our characters has made to the town of Nailsea in years. In our time, Nailsea is a popular commuter town for neighboring Bristol, but in the future of this novel it has become a climate refugee settlement. It is the place to which pretty much everyone in the region who wasn't killed off during the Big Chill fled. Bob, Jennie, Tom and Ifan all refused to move to Nailsea or any other settlement because they pride themselves on their autonomy and aren't interested in abiding by the strictures of life in such a community. They've also heard vague rumors that over the past few years Nailsea has become a place that's best avoided. However, they have no choice but to go there now, since that's where the nearest hospital is. It's at this point that the book's satiric elements come into play. Life in Nailsea proves to be the antithesis of the rugged individualism to which our main characters have become accustomed. The town's residents are guaranteed a living wage, housing and healthcare, but this social contract comes at the expense of their freedom. Once you're admitted into the heavily guarded biodome around Nailsea, you're prohibited from leaving. You're assigned a job and a residence and are expected to begin doing your part for the common good. The plot doesn't dwell long on Nailsea; our protagonists' stay there is just one of a few story threads. The author spends just enough time there to establish its basic dimensions and lob some pointed barbs at mass surveillance, totalitarianism, collectivist philosophies and indefinite detention without charge or trial, among other things. A common thread running through this book is Bob and Jennie's faith in God and divine intervention juxtaposed against Tom's resolute atheism. These two opposing pillars of belief make for an interesting dynamic, and we rarely get the sense that the author is attempting to evangelize–just as Bob and Jennie never try to push their religious views on others. The only point where things become a tad heavy-handed is when our main characters are moments from being flash frozen to death and everyone frantically begins praying together. Immediately after this prayer, their situation takes a turn for the miraculous. This scene seems intended to be ambiguous: Tom says he's praying only for his companions' benefit, and we're never given any indication as to whether this experience changes his beliefs, or whether he simply chalks their survival up to good fortune. While I do like this novel, I find it to be flawed. Its decision to abandon its satiric elements and head off in a new direction partway through its plot is disappointing. Also, it's unable to explore any of its themes in much depth due to its skimpy page count. Still, at least everything that it does contain is worlds above the woeful absurdity of The Day After Tomorrow.